As many of you know, I live for summer, but lately the tides have slowly be turning here at Haus of Girls. This December has been filled with more joy than I can ever recall in past Decembers. I’ve been a mom for seven and a half years, but this Christmas season seemed extra joyful in the mommy department. Maybe it’s because each day, I take the time to remind myself how lucky I am, more that I have in the past. Lucky to spend everyday at home. Never having to rush anywhere. I get to spend every minute of every day with Gracie, except when she’s at school. I get to see my two big girls off to school and welcome them home as well every single day. I can’t imagine anything different. The memories I am making with my girls seem more important and meaningful as I age. At thirty- two I probably have over five billion laugh out loud moments that I wouldn’t trade for the world. They make my life perfect filled with very few regrets. And here are a few other reasons why I’ve been so joyful this month…. I get to witness my girls excitedly search for “Clyde” every morning. I happily get to bake for my sweet clients and friends while all ten children sleep at one time. I get to laugh all day at this crazy girl who is really into “layering” this winter. She has NINE shirts on in this picture. I get to eat hundreds of candy canes while my sweet hubby keeps refilling the supply on our tree. I get to enjoy an early evening tea party. 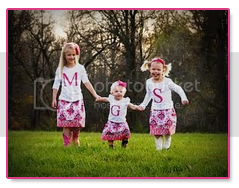 I get to sew my girls fun shirts and then take 2,000 pictures of them posing in the cold. They hate me now, but will love me when they are grown. I get to make fun little presents for my girls to hand out to all their teachers at school…. PE, art, music and even the bus driver. I’ve always tried to teach my girls how just a simple gesture goes a long way. Making someone smile and feel appreciated is one of the most important things in life. Speaking of feeling special, I received the most amazing and thoughtful Christmas gifts from my clients this year. I wish they could know how much this means to me. From wine, to a pedicure, to handmade thank you notes, to an amazing book (one thousand gifts) I can’t wait to read, I am so grateful and thankful. For them to take the time out of their busy schedule to do something kind for me, has me smiling from ear to ear. For them to make me feel noticed and appreciated for caring for their sweet children all year, is absolutely the best feeling in the world. I even get to lock my self out of Steve’s car when attempting to finish up my Christmas shopping. The good thing about that was that I was at Target. As usual for this crazy family, there have been several nights out filled with fun. This particular night we were celebrating my mom, as well as my brother in law Austin’s birthdays. We started at the Burger Bar, then moved into the attached casino, got kicked out of there, and then walked down the street to another bar. Yes, we got kicked out of a casino. Long story. We officially entered into a “club,” parents in tow, and had the best time dancing. I have three best friends (sisters) who don’t mind my creepy dance moves. Well, I guess these three are pretty awesome. So cute :) You and your family are SO rad!!!!! P.S. 1000 Gifts is a life-changing book!